Canstruction is special this year. Rather 2013 is going to be a special year for Canstruction. Because it takes place TWICE. Once for last year (2012) in February and then another one on the regular schedule in November 2013 as it always does. As many stories of compassion and kindness have come out since Hurricane Sandy here are the ones related to Canstruction. Jennifer Greene from Canstruction sat with us and told us that in her 20 years of being with the organization, every year is special. 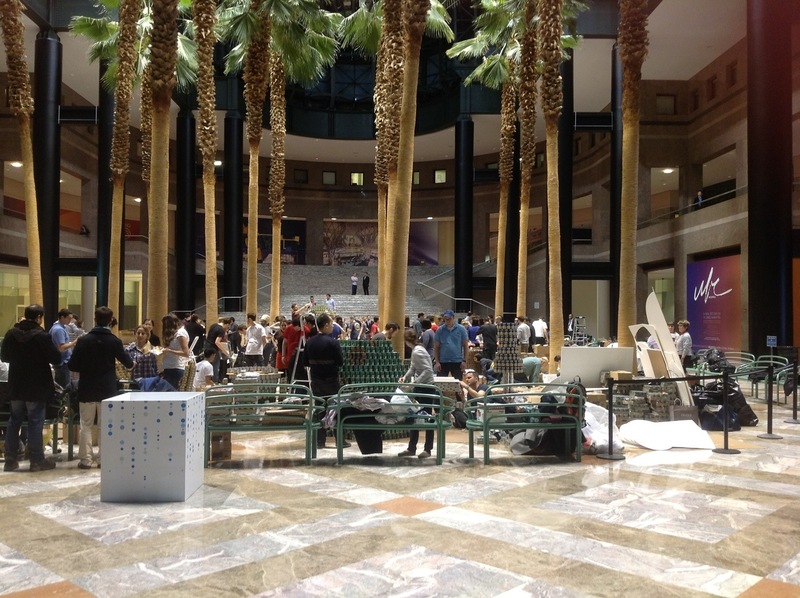 The first Canstruction started with 8 teams/entries, and this year the expected teams were going to be 31. But the Hurricane threw it off and this rescheduled date has 24 teams participating. What of the 7 that decided not to participate in the competition? In the true spirit of Canstruction, all teams donated their can collections right away to City Harvest so that they can be used for hurricane relief work. And 2 of those teams are back with MORE cans to build out tonight! Such spirit! Lisa Sposato, Associate Director for City Harvest, greatly appreciates the spirit of this particular Canstruction event because it brings to mind the issues pertaining to hunger and food scarcity in people’s consciousness even when it is not holiday time. These cans will be making their way to all 5 boros through City Harvest’s distribution network. Finally both Canstruction and City Harvest acknowledge the role and generosity of Brookfeild Properties who are hosting this event despite the fact that it is not part of the normal schedule of events at Brookfield for the year. Enough of this sentimentality….let’s get down to see some cool designs! This entry was posted in Design, LIVE! and tagged Canstruction, Hurricane Sandy, Live by Pollyanna. Bookmark the permalink.